In choosing where to stay on your summer vacation or weekend getaway, little things can make a big difference. Having off-the-street parking, for instance can be that added comfort you need after a long day of driving. This is just one of the many perks guests enjoy at the Carlisle House Bed and Breakfast. As a member of the Select Registry, Distinguished Inns of America, you can be assured of accommodations and services that go above and beyond other properties—all at prices that are competitive with neighboring lodging. In this month of Independence, we’re highlighting one of the most significant and emotional historic sites in our country: Gettysburg National Military Park. This is the site of the Battle of Gettysburg, a turning point in the Civil War, and the inspiration for one of President Abraham Lincoln’s most memorable speeches. Plan a day to walk the grounds and visit the several historic sites on the property. The Visitors Center at the park, located just south of historic downtown Gettysburg, is the ideal place to start a tour. 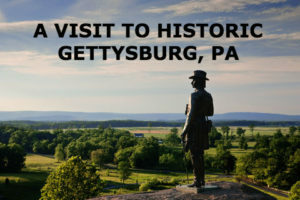 Here you can get an overview of the Battle of Gettysburg, learn about the causes and consequences of the Civil War, and the continuing relevance it has to today. Be sure to view the film “A New Birth of Freedom,” and see the Gettysburg Cyclorama, a remarkable—and massive—19th Century painting that has been fully restored. Also in this location is the wonderful Gettysburg Museum of the American Civil War, consisting of 12 galleries, with short films and artifacts from soldiers and civilians. April 1 – October 31, 8:00 a.m. – 6:00 p.m.
November 1 – March 31, 9:00 a.m. – 5:00 p.m. The centerpiece of any visit, of course, is Gettysburg Battlefield. You can explore this on your own with a self-guided auto tour, or by signing up with either a bus tour or guided car tour. Information for each of these can be found at the Visitors Center or on the Park website. Providing you have the time, there are three other notable historic places to visit while at Gettysburg. The David Wills House—former home of a Gettysburg attorney—is where President Lincoln finalized his Gettysburg Address. It is now a museum featuring six galleries and the bedroom where Lincoln stayed. Hours vary quite a bit throughout the year, so be sure to reference the website for the dates you will be visiting. The Eisenhower National Historic Site, adjacent to the battlefield, is the farm and home that served as the former President’s peaceful weekend retreat and often as a meeting place for foreign leaders. The George Sprangler Farm Civil War Field Hospital is a lasting example of a farm that was used as a field hospital during the Civil War, treating more than 1,900 wounded. Whether you’re touring Gettysburg, planning an outdoor adventure, or just wanting to relax for a few days, consider the Carlisle House Bed and Breakfast your base of operation. You’ll enjoy delicious breakfasts each morning, and have a welcoming and relaxing place to return to each evening. Call us to book your stay today! This entry was posted in Carlisle, Civil War, Historic sites, Historic Tours, Museums, PA and tagged Gettysburg, historic sites, History, museums by admin. Bookmark the permalink.